A report from Captain Ramil S. Palisoc, CMO Officer of 34th Infantry (Reliable) Battalion, 8th Infantry (STORMTROOPERS) Division, PA, revealed that said NPA rebels and supporters surrendered to the governments troops because they got disappointed in the so-called rebel’s cause that they were fighting for. Among these were the so-called revolutionary taxes or “butaw” which they exact from the hapless farmers in the far-flung barangays, implementation of swift justice or “Kangaroo courts”, and the existing infighting in the rebel’s organization due to financial matters and sexual abuse of their women-fighters. These were some of the reasons narrated plus the difficulties they experience as frontline fighters in the hinterlands while most of their cadres and political officers, who receive the collections from the “butaws”, are living in style in the cities and urban areas of Samar. Hence, they decided to surrender to live a normal life and return to the mainstream society. Said surrenderees turned over two cal .357 magnum pistols and were identified as Julio N. Lebico @ Tigbao - Yunit Milisya; Eduardo P. Rebato @ Arnie – Collector; Noinie R. Pajares @ Kutab - Courier; Rubin C. Pajares @ Tating – Courier; Danilo N. Pajares @ Maning – Yunit Milisya; Felomino D. Lebico @ Miko – Yunit Milisya; Danny L. Retamola @ Islaw – former CT member; Florendina S. Celis @ Flor – Barangay Organizing Party (BOP) member. 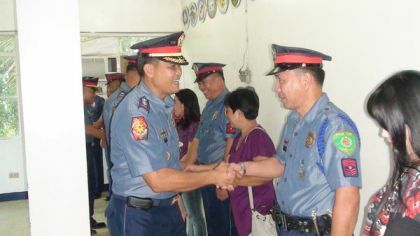 They may avail of the benefits of the Local Social Integration Program (LSIP) of the Province of Northern Samar after processing/validating the necessary documents including immediate financial assistance of ten thousand pesos (P 10,000.00), payment for surrendered firearms and livelihood assistance as prescribed in the LSIP, Provincial Order Nos. 05 & 08 of Northern Samar. It can be recalled from recent reports that a certain Rolando Albino alyas Sudlot and Virgilio Durin alyas Benny voluntarily surrendered to the 83rd CMO Company under 1Lt. Ian Michael Dr Hamid, Commanding Officer at Barangay Hinagonuyan, Catubig, Northern Samar on November 13, 2011. Said rebel returnees have already availed of the benefits of the Local Social Integration Program of the government and are now in the custody of 34th Infantry (Reliable) Battalion. Lieutenant Colonel William P. Penafiel Jr, Commanding Officer of 34th IB encouraged the rebels in the hinterlands to lay down their arms and live a normal and peaceful life.